It took ages to clear up lol!!! It's also three for two weekend on all on line workshops and project sheets over in the shop. If you fancy stocking up on crafty makes hop over and have a browse. Here's the link. Well my time in a quite house has come to an end. Bambinos are up and about so I'd better shake a tail feather and get some jobs done. Have a fun day whatever you have planned, thanks for calling by and look forward to catching up again soon. 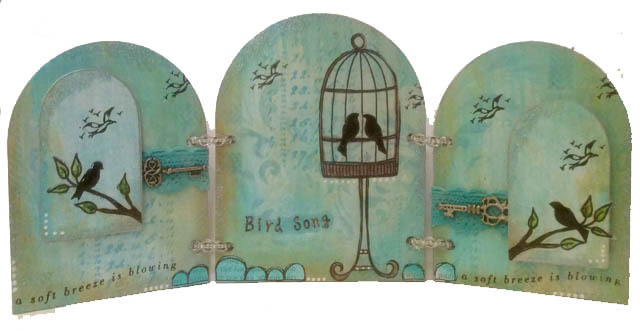 Evening Clare, This triptych is fabulous, I love the colours and the stamping, gorgeous !! I hope you are having a lovely Easter, I have been really busy this week with our Church services etc and today has been the cleaning in readiness for tomorrow morning. I'm hoping that I can get up in time for the 6.30am Dawn Service (especially as the hour goes on tonight !!!!) and then we have breakfast at Church after the Service, then clear up and off back home, to get changed etc and then back again for the 10.30 Family Service. A hectic week all told haha. Beautiful triptych Clare! I have been gone for 3 days so am catching up on what you have! !